Urban Armor Gear has protection available for many devices- laptops, tablets, and phones, and we have reviewed many of them here at TheGeekChurch. The case we’re reviewing today comes from the PATHFINDER series. The case we were sent to review is specifically for Samsung Galaxy S8, but you can also get them for iPhones. The PATHFINDER series cases come in black, white, and rust- which is the color we got. It looks more orange, and brighter than what you might think rust would look like, but still a very nice, sporty color. As with all of their cases, the Pathfinder series is drop tested according to military standard of 810G-516.6, which is assuring to those who want to protect their phones in case they drop. 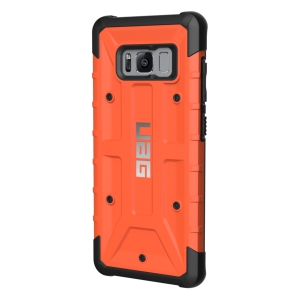 If you can appreciate this quality of case for your phone, they sell for $34.95 on the UAG site, or you can buy them at other places like Amazon, Best Buy and Wal-Mart.